How to drink whisky? Any way you like, though single malts deserve respect especially if your host pours you one. (They cost more than blends!) A measure of whisky is called a dram or a nip in Scotland. 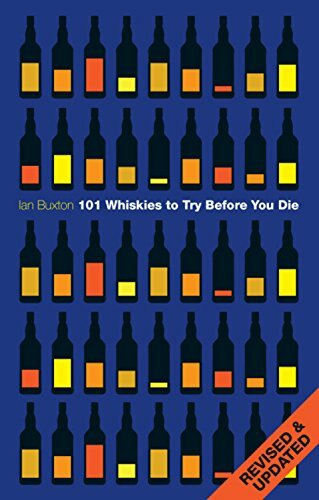 This page has loads of information - a whisky-bluffer's guide perhaps. *Whisky cocktail - the Rob Roy. But please note these remarks are intended for those who intend to drink malt whisky. If you want to drink whiskey (sic), then feel free to mix it with anything you like. I couldn't possibly comment. Should I add water to whisky? ...and other agonising protocols. In Scotland, you may encounter good-natured discussion on how to drink whisky: that is, with or without water, or with various mixers. What about ginger or soda? The addition of ginger as a mixer either as aerated water or ginger wine is still with us, though not altogether approved of in some conservative whisky drinking circles. In the UK, at least, whisky and soda has a clubby, cravat-wearing air about it. I actually like a blended whisky that way, except for the cravat bit. A good tip on whisky protocol: if your host in Scotland offers you a glass of whisky, (a dram) check, if you can, whether or not he or she is offering you an ‘everyday’ blend or a more expensive single malt. If a malt, recognisable by a single distillery name, eg Glenfiddich, Highland Park, Lagavulin etc, then your host may show slight annoyance or amusement if you drink it with anything other than water! Caol Ila means 'the Sound of Islay' in Gaelic. The caol part is usually anglicised to ‘kyle’ (on maps and place names) which means strait, as in a stretch of sea. What do you mean does that make it a straight whisky? It's the largest distillery on the island of Islay. An eastern malt, this one is named after a landmark hill on Speyside. The label says Ben Rinnes is the noblest peak in Speyside. No idea what that means. Further, the whisky is ‘muscular’. No idea what that means either. Dram - strictly speaking, a measure of whisky, but commonly used in Scotland to indicate a glass of whisky of any size. Nip - a slightly down-market dram; as a measure of whisky possibly smaller than a dram as well. From listening in to adults at our Hogmanay celebrations in my childhood, being offered a nip had something slightly sinful or daring about it. These damned Scottish Presbyterians.....they never did get the hang of enjoying themselves with a glass in their hand. A wee hauf - another label for a small glass of whisky but you'll probably never hear this expression - not in the exclusive bars you would frequent anyway - so don't worry about it. A 'hauf' is, of course, a half, pronouced 'hoff' because of our Scottish accent. And, come to think of it, a wee hauf is very small indeed. Perhaps it's homeopathic whisky. In certain contexts, I suspect it is spelled deliberately this way to annoy the Scots. (What? Me? Over-sensitive?) Anyway, more on the whisky / whiskey thing under whisky basic facts below. Read my blog post on the remake of the famous film Whisky Galore. Visiting whisky distilleries is a popular part of the Scottish visitor experience and they are great places to learn about the mystique of Scotland's national drink. As explained below, at malt whisky distilleries, visitors are given the opportunity to learn about the industry. Tours, audio-visual presentations and sampling the product are the essential ingredients. Many visitor centres at distilleries have a shop and a café or restaurant. Sometimes the admission price to the tour is refundable against the purchase of a bottle of malt whisky. Though the basic format involves a dram at the end, some whisky distilleries offer sophisticated tutored tastings not only of malt whisky of different ages, but also give an opportunity to learn about the different whisky regions of Scotland and the blending process. Some of the scotch whisky regions. Memorize these labels to bluff your way through any tasting. At Glengoyne, for example, their range of tours and tastings includes a Master Blended Session that allows you to assemble a blended whisky according to your own individual taste. Glengoyne is also easily accessible from Glasgow, and is close to Loch Lomond. Tucked away in the rich East Lothian countryside it is a classic Lowland malt that follows the usual visit format. Friendly and knowledgeable guides are a feature here - and the whisky, to my taste, at least, seems light and mellow - nothing difficult here! Over in Speyside (the valley of the River Spey in the north of Scotland), you can follow the Malt Whisky Trail. The signposts here read like a whisky gantry in places, and one of the most popular distilleries for touring visitors is Glenfiddich - it's a slick tour taking in the whole process all the way through to bottling - unusual that this part of the process is done on-site. And the 'Quaich Bar' of the Craigellachie Hotel has around 700 whiskies on shelves lining the walls, so you should find something to suit there. You'll find most of the Speyside hotels know their whiskies! Not all distilleries are owned by multi-nationals. Just a few are owned by inspired individuals with a real passion for the distilling culture and heritage. 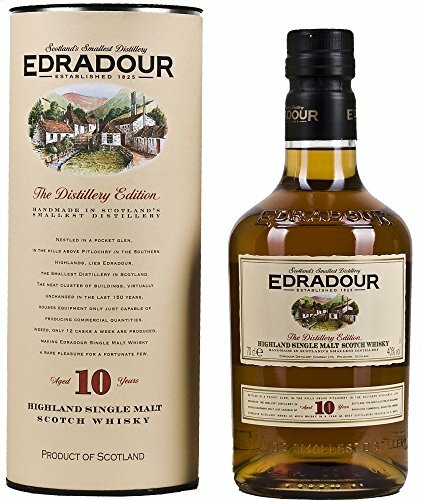 Edradour Distillery, above the resort town of Pitlochry, in the heart of Scotland, is a good example. You are quite likely to see the owner, Andrew Symington, in his working clothes, keeping an eye on the bustle in the reception area. The visit here has a special charm as Edradour is Scotland's smallest distillery in terms of its own output per week, though the warehouses also hold stocks of whiskies bought from other distilleries and aged here before being bottled and sold under the Signatory Vintage Scotch Whisky brand. (I should also point out that on one occasion when we were taking a journalist round, the owner gave us a bottle of the Natural Cask Strength Single Malt. That was a few years back but the whisky was sensational! However, Edradour isn't the only small-sale production run by a local team with passion: Bruichladdich on Islay is another example of this 'genre' - and they make the world's only organic single malt. If you want to discover a little about the early marketing of whisky, then Dewars World of Whisky in Aberfeldy, Perthshire, is particularly good on this aspect of the industry. Barley is the basis for malt whisky. This crop is just ripening, but is still a few weeks from harvesting. Scotch malt whiskies have a long tradition. For centuries, Scotland’s people, both Highland and Lowland, produced ‘uisge beatha’ ‘water of life’, long before it became an internationally-renowned drink. Now, malt whiskies are one of the most important and characteristic Scottish exports. There is still an element of mystery about the making of malt whisky from the simple ingredients of barley, water, yeast and, sometimes, peat smoke. And, it’s a mystery or mystique that is talked up and made much of by every whisky distillery in Scotland with a visitor centre. If you already know that whisky is the stuff made in Scotland (as well as Canada, Japan, Germany) while whiskey (sic) is made in Ireland and in the USA, then you may also know most of the next few paragraphs - but let's go back to basics for a moment. There are two main types of whisky – malt and grain. Malt whiskies, which connoisseurs claim have a more sophisticated flavour and bouquet and hence fetch a higher price, are made with malted barley. Malted barley is grain that has been allowed to sprout, then hot air dried. ‘Maltings’ are the industrial plants which undertake this process, these days mostly away from the distilleries themselves. Grain whisky also contains malted barley, along with unmalted barley and maize. 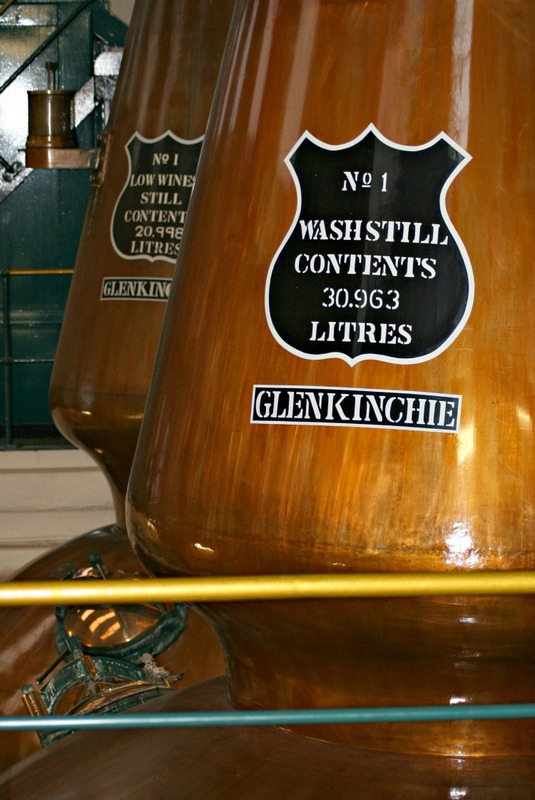 Both types are used in the whisky blending process. Some of the best-known whisky brand names are blended whiskies – sometimes known in our house as ‘cooking whiskies’ – but many whisky enthusiasts prefer to explore Scotland’s range of ‘single malts’, in other words, malt whiskies that are unblended distillations unique to each individual distillery. Malt whiskies are sometimes grouped as Highland, Lowland, Islay (from the island) and Campbeltown (meaning from the Mull of Kintyre). The Campbeltown malts are no longer significant and thus a dangerous over-simplification can be made into two very general types. Firstly, the malt whiskies made in the east (or north) of Scotland, eg Speyside. These malt whiskies tend to be lighter or ‘sweeter’ than the other main area – island or western malts which often have an easily recognisable taste of peat-smoke, or a salty, almost iodine-like taste of the sea. Whisky Distilling – what will I see at a distillery in Scotland? I think that even before you visit a real distillery, there’s a good way of getting some background to malt whiskies, if you are making Edinburgh your base. The Scotch Whisky Experience at the top of the Royal Mile, near the Castle, is a good starting point. Whisky distillers who push their brand of single malt by way of allowing visitors around the distilleries (and there are a lot of them in Scotland) are all faced with the same problem. Distilling, the making of malt whiskies, is all about waiting and judging and care. These are not especially exciting themes to work with from the point of view of a bus-load of tourists on a tight schedule. Each distillery makes a good creative effort to make the visitor experience memorable, though most emphasise the tradition, heritage and mystery. A good guide for your tour can make or break the experience (as indeed can the size of the sample you get to drink afterwards). ‘Old Glenmuckle single malt whisky was made illegally by the founder, Campbell MacAroon, but he applied for a licence then sold his product to the USA as well as to exclusive London clubs. The secret of the taste of Glenmuckle lies in the unique shape of the stills, as well as the magic spring from which the water comes. A typical distillery visit would show the following processes. Barley is soaked to start it sprouting, then spread out on floors to grow, after which it is dried. Actually, probably not. In most cases, it will have arrived by the truck load from the maltings. However, the old malting floor will be available as a corporate venue. Also available for weddings or ceilidhs. Having said that, some malting floors integral to the distillery do survive. During this drying process peat-smoke may give the malt its flavour. The malt is then ground and hot water added. The resulting liquid, called wort, is held in a mash tun, a large circular vat with a several thousand litre capacity. Water at high temperatures is washed through and run off, eventually to leave a sweet, semi-transparent liquid in the underback or worts receiver at the bottom of the mash tun. (Pictured) Dalwhinnie Distillery, as seen in a snapshot from a moving vehicle on the A9 'The Highland Road'. This distillery is the highest in Scotland. 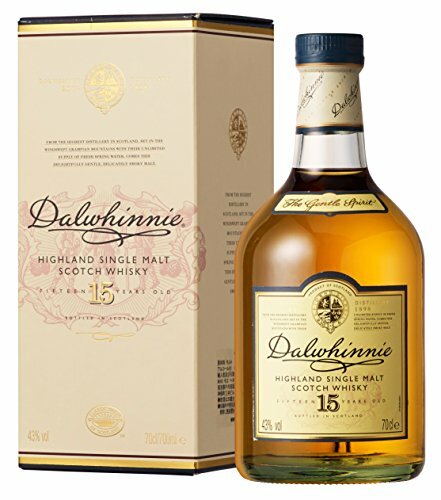 Nice single malt, too – plus they offer a delicious tasting session pairing malts and gourmet chocolates – yum! The now alcoholic liquid, known as the wash, is pumped via a wash-charger into a wash still – a large copper still where it is heated. The vapours condense in a worm, a coiled copper tube in a tank of cold water. This distilling process is repeated, at least twice. The distillate is then run into a spirit safe. Here the expertise of staff is used to decide the point at which the still is producing the purest whisky – as both at the beginning and the end of the heating/distilling process, there will be impurities. Only pure distillate is run from the safe into a spirit receiver. From here the product goes to a spirit store, where water is added to reduce strength, then it goes into casks for maturing. Oak casks previously used to mature sherry are sometimes used to give a distinctive flavour to whisky. These casks also add colour, and some experimentation goes on, creating flavours by maturing the spirit using imported casks from distilling/fermenting activities elsewhere in the world. Whisky matures by law for at least three years. Then it either goes to the blender or is left to mature for several more years before bottling as single malt. Been talked into serving Scottish food at a Burns Supper or a St Andrew’s Night event? Bad luck. Here are suggestions for authentic traditional menus. Is there really a Scottish culture? Or is it the same from the English Channel to the far north? No. It's another country. The Scots are different. Burns poetry is given an airing as part of a Burns Supper. Here's the format if you are thinking of organizing your own Burns evening. It's pretty straightforward , but be careful when you stab the haggis.The page also has some useful Burns facts - should be useful if you are, say, writing a speech for 'The Immortal Memory'. One of the most famous whisky cocktails is the Roy Roy. There are variations of the tale of its origins but it is possible that it was invented as part of a promotion for an operetta called Rob Roy. Written by the prolific American composer Reginald De Koven, the work was very loosely based on the life of the real-life Scottish folk hero. The show made its New York debut in October 1894, while the cocktail made its first appearance at the same time, in the Waldorf Astoria in Manhattan. This explains why sometimes the Rob Roy cocktail is described as a ‘Scottish Manhattan’ - but is always made with Scotch whisky. To make a Rob Roy: 2 parts Scotch whisky to .75 (ie three-quarters) part sweet vermouth. Add 3 dashes Angostura bitters per 60ml or 2 oz whisky. Pour into a mixing glass with ice, then strain off the ice. Serve in a cocktail glass with a cherry to garnish. There are variations: less vermouth; or dry vermouth, which makes a dry Roy Roy, or half sweet and dry which makes...och, you get the message. Some say use malt whisky - but if you do, just don’t let me get to hear about it!!! !